The Lagoon Nebula was discovered by Giovanni Hodierna before 1654 and is one of only two star-forming nebulae faintly visible to the eye from mid-northern latitudes. Seen with binoculars, it appears as a distinct oval cloudlike patch with a definite core. Within the nebula is the open cluster NGC 6530. Optical observation by the SPECULOOS Southern Observatory. Hubble's 28th birthday picture of the Lagoon Nebula. Infrared image revealing stars hidden behind dust and gas. ^ a b c "M 8". SIMBAD. Centre de données astronomiques de Strasbourg. Retrieved 2006-11-15. ^ a b Arias, J. I.; Barbá, R. H.; Maíz Apellániz, J.; Morrell, N. I.; Rubio, M. (2006). "The infrared Hourglass cluster in M8". Monthly Notices of the Royal Astronomical Society. 366 (3): 739–757. arXiv:astro-ph/0506552. Bibcode:2006MNRAS.366..739A. doi:10.1111/j.1365-2966.2005.09829.x. ^ "SIMBAD Astronomical Database". Results for Hourglass Nebula. Retrieved 2006-12-22. ^ Kronberg, Guy McArthur, Hartmut Frommert, Christine. "Messier Object 8". messier.seds.org. Retrieved 11 April 2018. ^ N. F. H. Tothill; Marc Gagné; B. Stecklum; M. A. Kenworthy (2008). "The Lagoon Nebula and its Vicinity". In Bo Reipurth (ed.). Handbook of Star-Forming Regions: Volume 2 The Southern Sky. Astronomical Society of the Pacific. p. 53. ISBN 978-1-58381-671-4. ^ "Off to a strong start". www.eso.org. Retrieved 4 March 2019. ^ "Hubble celebrates 28th anniversary with a trip through the Lagoon Nebula". www.spacetelescope.org. Retrieved 20 April 2018. ^ "Stormy seas in Sagittarius". Retrieved 31 July 2015. ^ The images show the sky at different levels: from the view seen by the unaided eye to one seen through an amateur telescope, with a final zoom in onto the Lagoon Nebula as seen through a professional telescope. 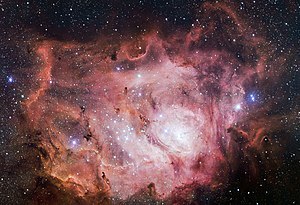 Wikimedia Commons has media related to Lagoon Nebula.